EBU and partners launch journalism initiative to combat disinformation. 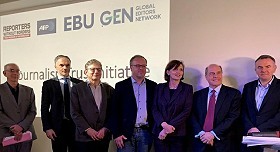 Paris, April 2018: An innovative self-regulatory media initiative designed to combat disinformation online – called the Journalism Trust Initiative (JTI) – was launched in Paris by the European Broadcasting Union (EBU), Reporters Without Borders (RSF), Agence France Presse (AFP) and the Global Editors Network (GEN). The project plan published on the CEN website is now up for comments and approval by all groups concerned. Those in favour of the document will then collaborate over a time-span of 12 to 18 months to develop the actual indicators. Hosted by the French Standardization Association (AFNOR) and co-hosted by its German equivalent the German Institute for Standardization (DIN).